Change to the sample directory (DEVELOPER_SAMPLES/jabber). Tip See the README.TXT file for additional instructions. Add the new JAR and any third-party JAR files used by the Jabber classes (for example, the SMACK API JAR files) to the CLASSPATH for all API Gateways and Node Managers on a host by copying them to the INSTALL_DIR/apigateway/ext/lib directory. Alternatively, you can add the JARs to the CLASSPATH for a single API Gateway instance only, by copying them to the INSTALL_DIR/apigateway/groups/GROUP_ID/INSTANCE_ID/ext/lib directory. 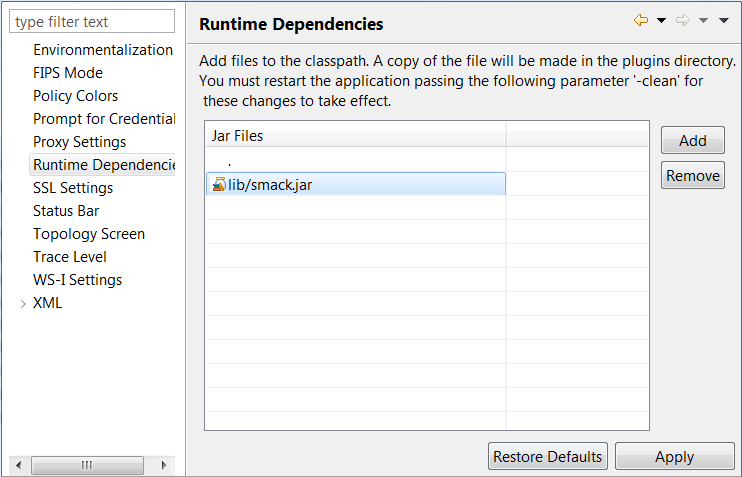 Add the new JAR and any third-party JAR files used by the Jabber classes (for example, the SMACK API JAR files) to the runtime dependencies in Policy Studio. Select Window > Preferences > Runtime Dependencies, and click Add to browse to the new JAR and any third-party JARs, and add them to the list. Click Apply to save the changes. The following figure shows the runtime dependencies. Restart the API Gateway instances and Node Managers. The extension kit includes all of the associated resources and classes to create the Jabber Filter. For example, API Gateway ships with specific versions of several Apache Commons JARs. Introducing conflicting versions of these JARs could adversely affect the ability of the API Gateway and Node Manager to function correctly.